Once a new Arduino user has worked through the myriad of possibilities with their board, there will come a time when they need more digital output pins. Although it's easy to just say "Oh, now you can buy a Mega" there are much more affordable and educational ways of solving the problem. One of these is to learn how to use the 74HC595 shift-register IC. For the uninitiated, it has eight digital pins that can be controlled by sending a eight bits of data (which are high or low) from the Arduino, which then determine the pin state on the shift register. If this is a new concept, visit the Arduino ShiftOut tutorial over at the Arduino website, it explains in detail how to use one or more shift registers to expand the number of digital outputs very easily. And we're on twitter and Google+, so follow us for news and product updates as well. 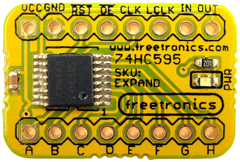 When working with 74HC595 shift registers and solderless breadboards (or more permanent solutions) consider using the Freetronics EXPAND: Expansion/Shift register module. It contains the 74HC595 shift register on a small board with standard 0.1" spacing holes that are perfect for soldering header pins into for breadboard use, and a small "power on" LED. By doing this you have a robust vehicle to insert and remove easily without tools or the risk of bending the IC pins. This is only one of our large range of prototyping modules - check the full range today! want to have a price list please . thinking of buying items for school projects.